Imagine a world where users can solve their desktop issues without calling help desk. These Windows 7 resources may bring you one step closer to that IT Utopia. Windows 7 has several tools that can help users troubleshoot operating system and application problems on their own, leaving you free to handle the big stuff. As you upgrade your enterprise desktops to the new OS, you should explore the following resources. The Action Center is the first item in theControl Panel, and inside it, you can see recent messages, begin troubleshooting and restore the OS to a previous state using restore points in System Restore. 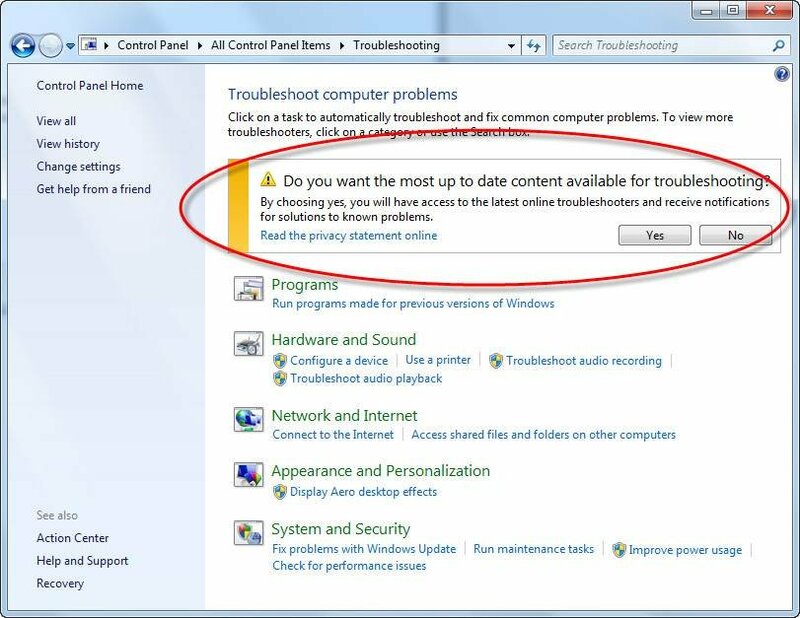 Microsoft lets you get the latest information available for troubleshooting problems as new content is developed. You can also check application compatibility, hardware and Windows Update. If these built-in tools aren't enough for addressing OS and application problems, you may want to check out the Microsoft Fix it Solution Center. These enhanced troubleshooting tools don't stop at the OS. Since Office 2007, Microsoft has been moving to a more current online help model. Lately, I've depended on this information to use the advanced features of Excel and PowerPoint. I've also used the documentation and troubleshooting features built into Windows 7 when problems have arisen. That's something I never thought I'd say. If all else fails and you need to get others involved with troubleshooting, the Problem Steps Recorder tool can help. The Problem Steps Recorder automatically captures any steps you take on your system and includes detailed descriptions and screenshots. To load this tool, just enter "problem steps" under Start/Run in Windows 7. In the end, Google and Bing are only going to get you so far in many enterprise desktop support situations. If you're like me, you often end up more frustrated and further behind than when you began looking for solutions. But at the same time, traditional help documentation typically isn't worth the hard drive space it takes up so it's nice to see that Microsoft is heading in the right direction. Don't get me wrong; I'm not saying that these tools are going to magically eliminate help desk calls in your enterprise. However, some preparation, user training and decent tools to fall back on will get you that much closer to a less hectic and less stressful environment. Kevin Beaver is an information security consultant, expert witness and professional speaker at Atlanta-based Principle Logic LLC. With over 21 years of experience in the industry, Beaver specializes in performing independent security assessments revolving around information risk management. He has authored/co-authored eight books on information security, including The Practical Guide to HIPAA Privacy and Security Compliance and the newly-updated Hacking for Dummies, 3rd edition. In addition, he's the creator of the Security On Wheels information security audio books and blog providing security learning for IT professionals on the go. Kevin can be reached at www.principlelogic.com, and you can follow in on Twitter at @kevinbeaver. Windows 7 32 bit, after blue screen crashes I have hundreds of files in CheckSUR need fixing I have no idea where to start. Can someone help please?